Chelsea fans have been understandably underwhelmed by Alvaro Morata since he joined the club from Real Madrid last summer. 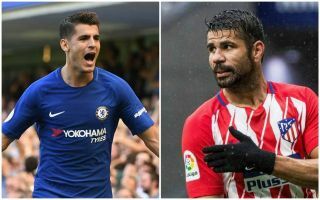 The Spain international has just 16 goals in 56 appearances for the Blues and has basically looked a downgrade on Diego Costa, who left the club last season to return to Atletico Madrid. Bizarrely, however, Costa’s form also looks to have taken a real hit, as he’s on a lengthy goal drought now, stretching to 16 La Liga games. The 29-year-old has found the back of the net in the Champions League this season, scoring in his side’s win over Monaco, whilst also netting in the Super Cup. Still, this is a big concern for Atletico, for whom Costa was lethally prolific during his first spell. The Brazilian-born forward was also generally a big hit in his time in the Premier League too, which is why so many Chelsea fans have been underwhelmed by Morata arriving in his place. Still, the 25-year-old does at least have one more league goal than his predecessor this season – even if the bar hasn’t been set particularly high. 40-year-old Didier Drogba back to Stamford Bridge for a third spell, anyone?